This evergreen orchid is a perennial rhizoma­tous herb of the forest floor. The horizontal rhizomes, usually covered lightly by leaf litter, bear roots at intervals and terminate in a rosette of leaves. Leaves are alternate, somewhat crowded together, and only slightly elevated above ground level. Leaf blades are ovate, 3–8 cm long, and 1.5–3 cm wide, often of varying size within a rosette. Leaves are present year-round, bluish-green, with prominent white veins; on each leaf, a broad midvein is flanked by two smaller veins that arise near the base of the blade and converge near the apex. Additional fine veins complete an irregular network pattern. In summer, robust plants produce an elongate flower stalk, 10–40 cm tall, from the center of the rosette. In contrast with the rosette leaves, the inflorescence stem and reduced bracteal leaves are densely downy. Flower stalks produce 20–80 evenly spaced, small white flowers in a dense terminal spike. Each flower, subtended by a narrow bract, is initially more or less circular in outline, but petals and sepals later diverge, transforming the circle to a roughly triangular outline. As is usual with orchids, there are three sepals and three petals, one of which is distinctively modified as a lip. Further, the stigma, style, and, in this case, one anther, are complexly fused to form a central column. Open flowers of Good­yera are dom­i­n­ated by the saclike lip; two sepals flank the lip, and the remaining sepal and two petals are crowded together, forming a hoodlike ­cover over the column; the ovary is inferior. Fruits are globose to ellipsoid capsules, 6–8 mm in diameter, bearing numerous small, dustlike seeds . encompassed orchids now classified in several different genera. It was Robert Brown who recognized Goodyera as a distinct genus, and he published the binomial by which we now refer to this species in 1813. The genus name commemorates John Goodyer, a 17th-century English botanist; pubescens refers to the downy hairs that are so abundant on the flower stalk. The common name plantain has been applied to diverse, unrelated plants that have broad, flat leaves, the word being derived from the Latin word planta, referring to the sole of the foot. Rattlesnake in the common name alludes to a fancied resemblance of the prominent reticulated veins to the scaly skin of snakes. Species of Goodyera can be found throughout much of the north temperate zone, as well as in Australia and on several oceanic islands. Twenty-five would be a conservative estimate of the number of species, globally, in the genus. 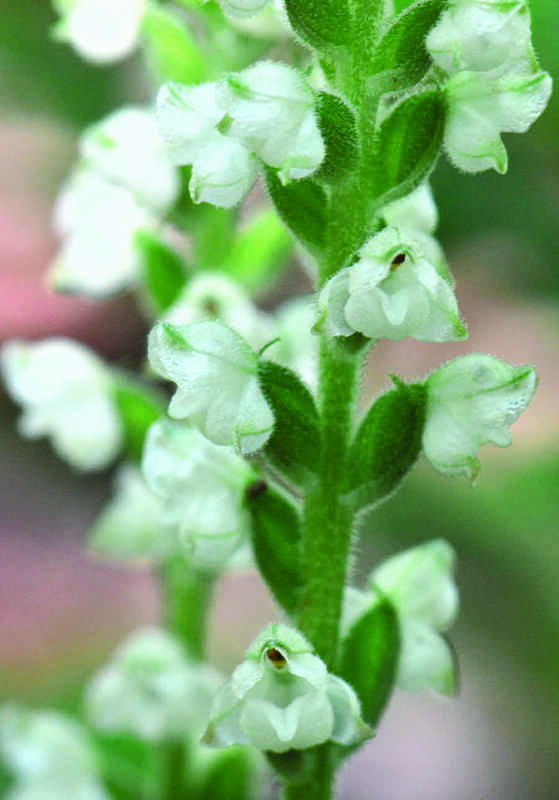 In addition to G. pubescens, G. repens, Dwarf Rattlesnake Plantain, can be found as a rare plant in the mountains of Virginia. Goodyera repens can be distinguished from G. pubescens by a dark green line in the white midvein, its overall smaller stature, and flower placement on just one side of the flower stalk, or flowers forming a spiral. 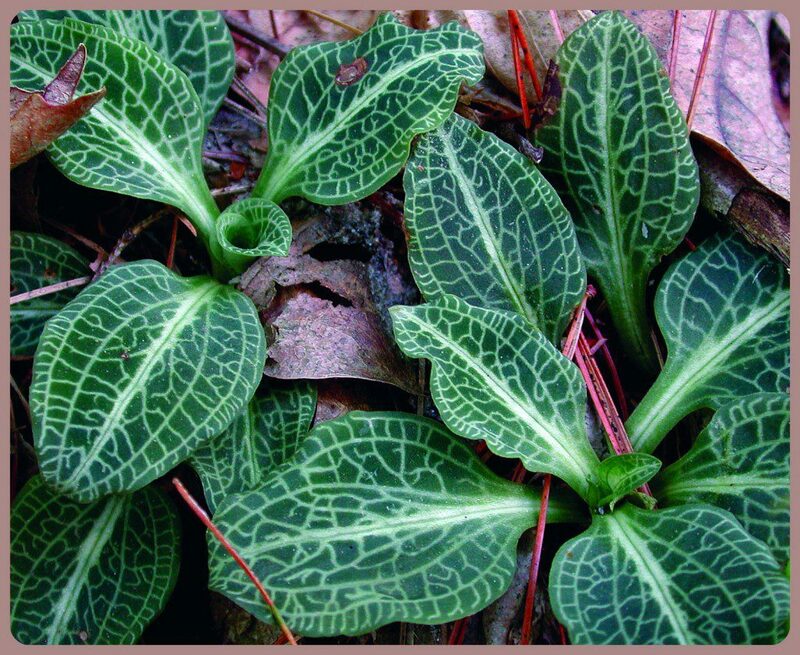 Downy Rattlesnake Plantain is a plant of ­mesic to dry forests. As is typical of orchids, the roots have a mycorrhizal relationship with fungi that assists the plant in the acquisition of moisture and ­nutrients, while the plant provides products of its photosynthesis to feed the fungus. Flowers are pollinated by bumblebees and other native bee species. 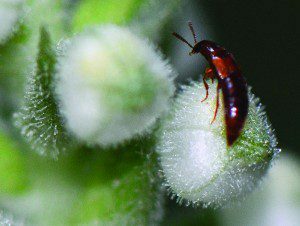 Pollination often has a high rate of success, and many flowers produce mature fruits. Also typical of ­orchids, the seeds of this species are minute and dustlike, bearing few nutrients to assist in the establishment of new seedlings. 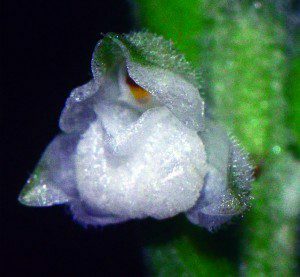 Seedling establishment requires assistance from soil fungi, from which the orchid derives the organic molecules it needs until it can make its own food via photosynthesis in its leaves. Downy Rattlesnake Plantain is described as easy to grow in a woodland garden situation. It requires dappled sunlight, acidic soils with organic matter, and a layer of mulch to ensure consistent soil moisture. Because nursery-propagated plants of this species are available only from specialty native-plant nurseries and because digging from the wild cannot be condoned, it may be best not to try to grow it in a garden. Ethnobotanical references note that Goodyera pubescens was used by Native Americans for a wide variety of medicinal purposes, but none of these applications can be recommended in modern medical practice. The conservation status of Goodyera pubescens is secure at present. Nevertheless, like all native plants, its populations are subject to habitat alteration. Downy Rattlesnake Plantain can be found throughout Virginia. Moreover, it is widely distributed in eastern North America, from Maine to Minnesota, and south to eastern Oklahoma, Arkansas, Alabama, Georgia, and South Carolina; occurrence is spotty in several states of the Midwest. .org or send an SASE to the Virginia Native Plant Society, Blandy Experimental Farm, 400 Blandy Farm Lane, Unit 2, Boyce, VA 22620; e-mail info@vnps.org; or call 540-837-1600. To see and learn more about interesting species of plants native to Virginia, visit www.vnps.org and contact your chapter of VNPS (details on the website) for the times and dates of programs and wildflower walks in your area.